240 pages | 27 B/W Illus. Leo B. Hendry is one of the foremost developmental psychologists of his generation. His diverse range of interests have included studies on young people’s involvement in competitive sports, investigations into teacher and pupil relations in school, adolescents’ leisure pursuits and their family relations, parenting styles, youth workers and mentoring, youth unemployment, adolescent health behaviours, and transition to early adulthood. His research interests now include work on ageing and retirement. Developmental Transitions across the Lifespan is the first collection of Hendry’s works, and essentially joins the dots to provide an overarching perspective on lifespan development through a dynamic systems theory approach. Underpinned by empirical research, this collection of journal articles and book chapters is linked by a contemporary commentary which not only contextualises each piece within today’s research climate, but builds to provides an unorthodox, comprehensive but above all compelling perspective on human development from childhood to old age. Leo B. Hendry’s research output has been significant and influential. This is an important book that will provide students and researchers in developmental psychology not only with an opportunity to view his contribution holistically, but in connecting his range of research interests, provides a new contribution to our understanding of lifespan development in its own right. "The common thread throughout this collection is interactive processes operating across the lifespan, as distinguished from the traditionally accepted heuristic concept of discrete stages of development… Focusing on coping strategies in reacting to various situations, Hendry offers qualitative and quantitative analysis of statements by interviewees across various settings both domestic (in this case, the UK) and international. The narrative is easy to follow and leavened with humor. Summing Up: Recommended. All readers." 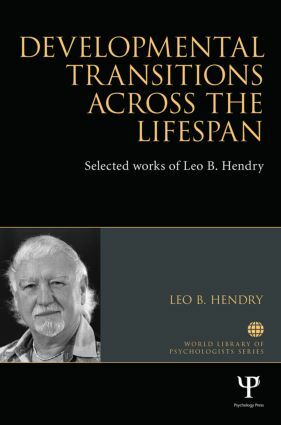 "This wonderful book unites examples of the immense productivity of Leo B. Hendry over his life span, and of his innovative research that truly bridges the disciplines of psychology, sociology, and education. His work is theoretically strong, brilliantly reflected and many of his tenets have had, and still have, immense practical consequences for parents, teachers and counselors." "This unique collection brings together a number of Professor Hendry’s key contributions to knowledge throughout his long and distinguished career: it makes fascinating reading." Leo B. Hendry is former Professor of Psychology at the Norwegian University of Science and Technology, Trondheim, and at the University of South Wales, Glamorgan and of Education at London and Aberdeen Universities; and is now Emeritus Professor, University of Aberdeen. He has been Visiting Professor to many universities in Europe, Canada and the Americas, and worked as a psychological advisor to the Family Support Division, American Forces (Europe) till 1989. He has carried out research projects for both national and international funding bodies and published over 150 research articles, 27 book chapters, and 22 books, which have been translated into 9 foreign languages.